Dylan Roth ’18, Kaitlyn Kirkpatrick ’18, Tristan Ellis ’18, Elise Nelson ’18 and Paige Sutton ’18. Sustainability, gaming, music appreciation, holistic wellness, Christian fellowship, arts and theatre, publications, historians—for students at Albright, shared interests go beyond extracurricular activities and organizations. Shared interests bring students together to experience independent group living while being immersed in a learning environment. Affinity housing began at Albright in 2011, says Amanda Higginbotham, director of residential life. The houses—there are eight—accommodate three to six occupants, and students are required to apply in the spring for the following academic year, outlining a plan for their theme. They are also required to hold at least two events each semester that are open to the campus community and that have an educational or service component. Students living in affinity housing are expected to keep the homes clean and well-maintained; Albright’s facilities department takes care of repair work. An area coordinator from the office of residential life, Michael Capogna, meets biweekly with the student house manager to make sure the house is in good shape and that the students are planning programs, Higginbotham says. The houses—modest, single brick homes with yards on the edge of the campus—provide an alternative to the residence halls and the college-owned apartments that Albright offers. Having such options has become more important since the College began a new residential policy, announced in the fall of 2016 for implementation in fall 2017, in which all traditional, non-commuter students are required to live on campus all four years. Wesner, who was formerly director of the Gable Health Center for 20 years, says Albright wanted to bring everyone back together as a community. “National data shows that if students don’t feel connected, they don’t do well in school,” Wesner says. Albright’s affinity houses currently accommodate about 40 students, but they have become hubs of activity because of the events they hold. Recent graduate Kylie Johnston ’18 lived for two years in the Music Appreciation House, where all five residents were music industry studies majors, who are “applying things we learn in our classes to organizing events,” she says. Last year, at a different address, the Music Appreciation House began holding concerts featuring Albright, local and regional musicians in their basement, with as many as 50 people attending. Now they hold the concerts on the back porch of the new house. 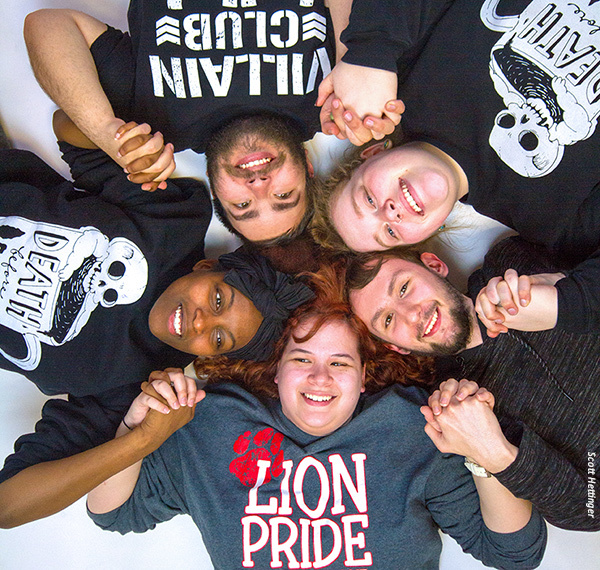 They have held student showcases, and have hosted bands from Albright’s on-campus record label, Lion Enterprises. Outside acts like Colton Kayser from New Jersey, Ragged Lines from Philadelphia and Drew and the Blue from Kutztown have performed in their “Musty Basement” venue. Charles Whitney ’19, a 22-year-old from Philadelphia, has been a member of Albright’s Gamers Guild—one of the oldest clubs on campus—since he was a freshman, so this past year, he moved into the Gamers Guild House on Rockland Street. As a game and simulation development major, Whitney says the house is a perfect fit for him. He and the other people in the house host a game night every Friday for anyone who wants to come. They have an enormous collection of video, role-playing and board games, as well as a Wii and a TV; visitors are welcome to bring their own games to share as well. Usually, 20 or 30 people show up to participate. They also host trips to outside facilities like Sky Zone and Laser Quest. Higginbotham says there has been a significant increase in affinity housing this past year, having received the greatest number of applications to date. Plans to expand the program over the next several years include offering more and varied housing options, additional support for programming initiatives and events, a continued effort to seek opportunities for campus partnerships, and even more faculty engagement. “To allow the affinity housing program to truly grow and flourish we hope to seek external funding sources and gifts to support house upgrades and renovations,” Higginbotham says. This year, a variety of student clubs and organizations are being housed together, including Vision One Fashion, International Student Association, Media and Arts, Music Appreciation, Black and Latino Empowerment, Multicultural House, and the Hub for Holistic Living.